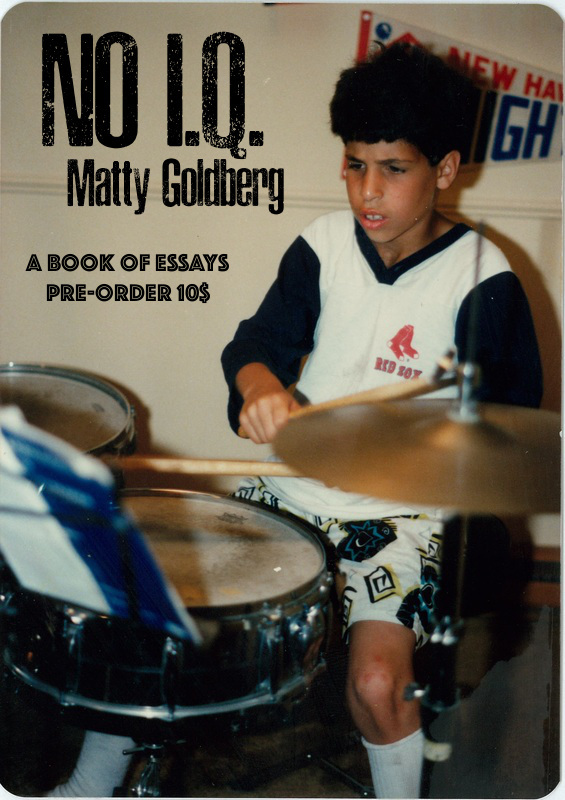 Matty Goldberg - Book: No I.Q. I want to thank everyone who enjoyed reading my first book, Brain Humor. The experience was so fulfilling I decided to write a second book of personal essays. I tried fitting a few of these essays into Brain Humor, but it didn't work out, so I reworked them for this book. The book will be out in October, but you should pre-order it with the link above for a few bucks off the price. Down below are some frequently asked questions about the book and what to expect. Q. Why did you title this book No I.Q.? A. No I.Q. was the name of a punk band I was in back in my high school days. One of my essays goes through my times thinking I was going to be a rock star. It also fits in with my self deprecating sense of humor. I never had a No IQ album. Why not title it a book? Q. When will the book be released? A. The book will be released at the end of October. Q. How many essays will be in the book? A. The book will feature ten essays. A buck an essay. Q. Will there be a book party? A. Yes. Stay tuned for more info. Q. Is there an official website or twitter for the book? A. To make things easier, all info will be posted in my personal website, facebook and Twitter pages. Q. If I don't have PAYPAL how else can I buy the book? ​A. The book will be on amazon in both hard copy and kindle format. You can also pre-order it on Venmo for $10.00 just be sure to put your address in the subject. Q. What song are you listening to right now? A. I'm so fancy by Izzy Azalea. Hope this helps and thank you all for your support! !